at that distance the could probably just throw their guns at him with better results! Exactly! I bet he’s in more danger of being burned to death from flash burns than actually getting hit by flying lead. 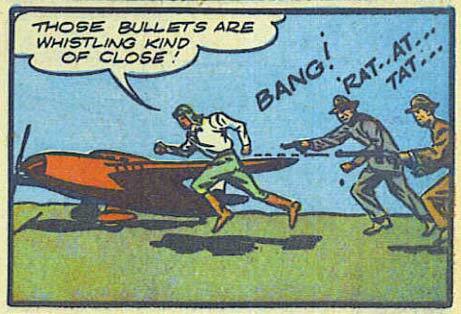 “Rat-at-tat?” The guy in the rear has an automatic weapon and can’t hit at essentially point blank range. Maybe they have orders not to kill their target. Is he hoping to get in that plane or is it just randomly sitting in the background for no apparent reason? I only say that because that plane looks like it might leave him a little squashed when he gets in. Ah, the old switch the bullets out for blanks gag.